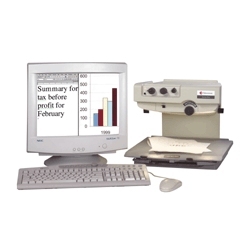 The newest product in the TSI family of computer-compatible video magnifiers, the Genie Pro can be used with most computer monitors or televisions to create a color magnification system that best suits an individual�s unique viewing needs. Using advanced technology to support multiple computer resolutions and frequencies, the Genie Pro allows a user to simultaneously view the computer image and the video magnified image when attached to a compatible computer. This split screen mode helps create a work station environment allowing an individual with low vision to view magnified images while also reviewing information from their computer. In addition to full color, the Genie Pro displays your printed material in high-contrast black text on a white background and white text on a black background along with offering twenty-four background/foreground color combinations to make viewing comfortable for each user. Additionally, the user can display vertical or horizontal line markers and shadow mask to help track text and reduce glare. This system also features an extremely large depth of field for viewing three-dimensional objects and a smooth, non-glare reading table which permits reading heavy books. Monitor not included - Genie can be used with SVGA and multi-sync monitors and S-video monitors.